Home » Football » Football Cards » What Are the Most Valuable 2011 National Treasures Football Cards? 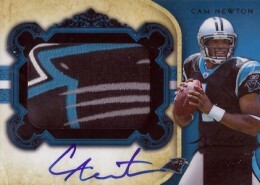 What Are the Most Valuable 2011 National Treasures Football Cards? When it comes to high-end football cards, few come close to Panini's National Treasures. And with a strong rookie crop this past year, 2011 National Treasures Football has continued to tempt the wallets of collectors. During its first week of release, single-card sales were strong, with seven cards going for $2,000 or more on eBay. 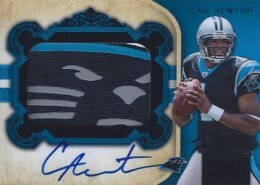 This includes a high of $3,500 for a 2011 National Treasures Football Rookie Signature Materials Black Cam Newton numbered 1 of 25. 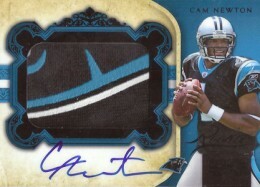 Of the top ten 2011 National Treasures Football eBay sales, eight of them were Cam Newton cards. His rookie parallels were especially popular. 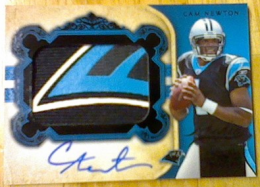 The cards feature massive patch swatches, several of which have the face of the Panthers logo. Although there isn't a ton of space for his signature, autographs are still all on-card. 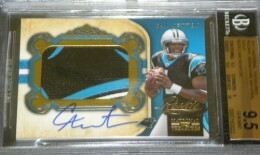 Besides the top-selling card, other Newton Black parallels sold for $2,800, $2,650, $2,550 and $2,500. A Gold parallel numbered to 49 and graded 9.5 by BGS went for $2,499 while an ungraded version changed hands at $1,725. 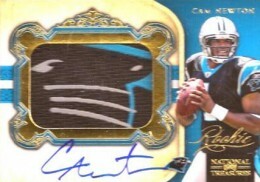 The only non-rookie Cam Newton parallel on the list is a Rookie Brand Logos Signature card numbered to 10. The card vertical card has a full Reebok logo to go along with an on-card signature. The card sold for $1,725, good for ninth spot. The top card not to feature the NFL's 2011 Offensive Rookie of the Year was a 1/1 Brand Logos Signature card of Aaron Rogers that sold for an even $2,000. An Andy Dalton Rookie Signatures Material Platinum parallel numbered to 5 went for $1,950. Expect more high sales from 2011 National Treasures Football in the weeks and months ahead. Boxes have been strong sellers, despite their massive price tag. The fact that the set was released just a couple of days before another high-end product, 2011 Panini Playbook Football, hasn't seemed to have hurt sales either. #10 10 (ONLY 10 1 1) 2011 NATIONAL TREASURES BLACK AUTO AUTOGRAPH BEN TATE $100? Dalton 5/5 just sold on EBay for $2,375 !! How much do you think the 4 horsemen would go for??? I just pulled it!! !